Late last month Doctor Noize and his fellow musicians, Th International Band of Misunderstood Geniuses, released the group’s latest adventure from Phineas McBoof. 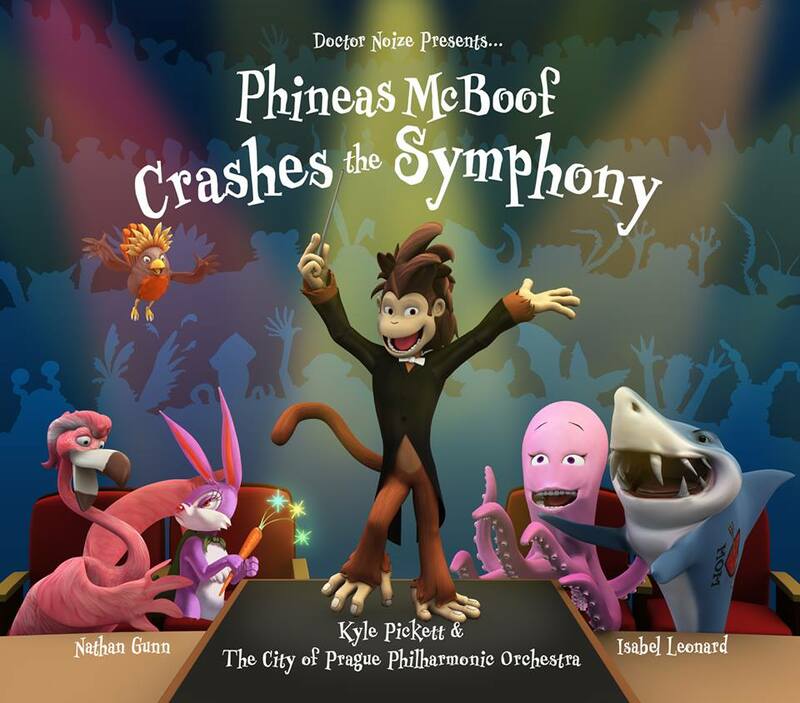 The album, Phineas McBoof Crashes The Symphony was the seeming finale in the ongoing story of the world-renowned musical monkey. If it was indeed the final movement (bad pun fully intended) in Phineas’ musical story then it was quite the ending. Luckily for those that might be new to Phineas and his adventures, the first two “chapters” in his adventures are also available. And they are available not just on CD but also in print. The story’s first chapter is titled The Ballad of Phineas McBoof and the second “chapter” The Return of Phineas McBoof. For those that might be new to adventures of Phineas and his band mates, both chapters are just as enjoyable as the latest. This applies both to the stories’ print and musical platforms. This critic will attempt to explain why in as much depth as possible and as clearly as possible beginning with each chapter’s story. The presentation style of each “chapter” is just as important to note as its story. That will be discussed later. Last but most definitely not least of note in examining these two stories is the visual imagery that is used in the stories’ print platforms. It plays just as much of a role in each chapter as each chapter’s story and the manner in which each is told. Each element is clearly important in its own right to the whole of these two chapters in McBoof’s story. Altogether they make the first two “chapters” of Phineas McBoof’s story just as enjoyable for listeners as its latest (and last?) entry. The first two “chapters” in the story of Phineas McBoof and the International Band of Misunderstood Geniuses are not new releases for 2016. That goes without saying. 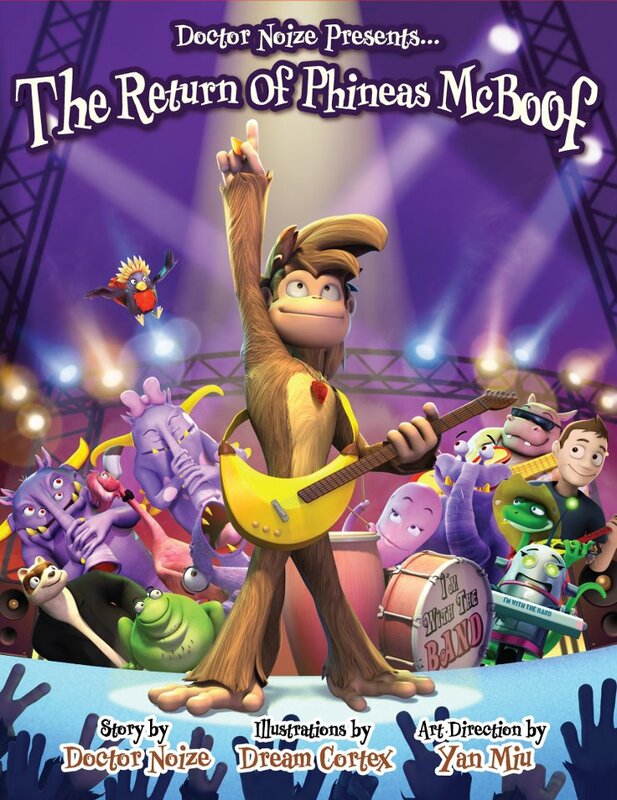 For those that might not be so familiar with the adventures of the musical monkey and his fellow animal band mates though, these two chapters make a great introduction to the group and its adventures. That is due in part to the story presented within each chapter. Each of the story’s first two chapters tells one part of how the band came together. In “Chapter One,” The Ballad of Phineas McBoof , listeners learn that the whole story came to be because Phineas had become tired of the rock star life that he led. Doctor Noize points out that Phineas wanted something new because his stardom had left him in fact feeling trapped. So he set out to start over so to speak, leading him to meet the first members of his new band—Backbone the Octopus, Bottomus the Hip Popotamus, Riley the Robot, Lenny Long Tail, and the Ooh Gah Boo Gus. The Return of Phineas McBoof continues that story, introducing Sidney The Beak, Luciano Frogerati, Jose, and Placido the Flamingo. At the second “chapter’s” conclusion Phineas once again disappears, which sets up the story’s latest installment, and likely its last. The story is in itself fun throughout both “chapters” That is because of just how original it is both in the realm of children’s music and in the realm of children’s literature. Speaking of those two realms they “play” into the next important element of each chapter, its presentation style. The story that is presented in the first two “chapters” of Phineas McBoof’s tale is in itself plenty of reason for families to add them to their home music libraries. 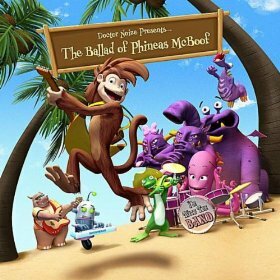 It is the story of how Phineas and his band mates came to meet and form their musical collective. While the story presented in each “chapter” is entertaining in its own right the story itself is just one of those installments so enjoyable. The manner in which each “chapter” is presented—its presentation style—is just as important to note here as the story. Each installment is presented both in musical and print platform. The two platforms compliment each other perfectly. The print platforms tell the story in a style that would make Dr. Seuss proud if he were alive today. That is proven in the rhyme scheme used within each book and the very words that are used including the characters’ names. The books’ musical companions complete the experience. That is because they take the tales told in the story’s books and expand on them even more with an even fuller telling of the story complete with various musical genres and pop culture references (including references to Thelonius Monk, Ringo Starr, The Beatles, etc.). Each presentation in itself does its own share to entertain listeners of all ages. The pair works together to keep listeners completely entertained throughout each tale. Even as entertaining as the story’s dual presentation style is in its bigger picture, that dual presentation style is still not all that makes the first two “chapters” of Phineas’ story so enjoyable. The imagery that is presented in the story’s literary platforms rounds out the story’s most important elements. The story that is told through the first two “chapters” of Phineas McBoof’s tale is in itself more than enough reason for listeners of all ages to check out these two tales. They form a solid foundation for the final “movement” in Phineas’ adventure. The two different ways in which the story is told in each “chapter” makes Phineas’ adventure all the more enjoyable. It is told both in print and through music. Both platforms expertly complement one another, making the story even richer. While the story’s dual presentation offers a certain sense of completion for listeners, it does not make Phineas’ story one hundred percent complete. The illustrations that are used in the story’s literary presentations complete the adventures presentation. It is clear that the artwork that is presented in each book was crafted wholly via computer. On the surface that might not seem very creative. But in a deeper sense, it actually is very creative. Parents might recognize the artworks style as being very similar to that used in the classic Super Nintendo game Donkey Kong, Jr. It is an artistic style that has been very rarely used since the days of that game (and video game system) if at all. The world created through the artwork is rich and vivid. The scenes that are presented are, in whole, expert visualizations of the given scenes, too. They do a wonderful job of bringing those scenes to life. That is especially the case when taking in the story’s broader musical presentation. Audiences will not just see the scenes come to life, but advance in their own minds. This brings everything full circle. It makes suspension of disbelief all the easier for audiences and in turn makes the story all the more entertaining and engaging. Keeping all of this in mind, The Ballad of Phineas McBoof and The Return of Phineas McBoof prove themselves to be wonderful additions to any family’s home library and a wonderful start to the tale of Phineas’ adventures. This applies whether audiences already own McBoof’s latest adventure or not. This entry was posted in Books, Celebrities, Internet, Music and tagged celebrities, Doctor Noize, Doctor Noize and The International Band Of Misunderstood Geniuses, Doctor Seuss, entertainment, facebook, internet, Luciano Poveratti, music, Phils Picks, Phineas McBoof, Placido Domingo, Ringo Starr, The Beatles, Thelonius Monk, Theodore Geisel, Twitter, Wordpress by philspicks. Bookmark the permalink.